, a learned physician and botanist, of a West Friesland family of good repute, was born at Mechlin, in 1517. 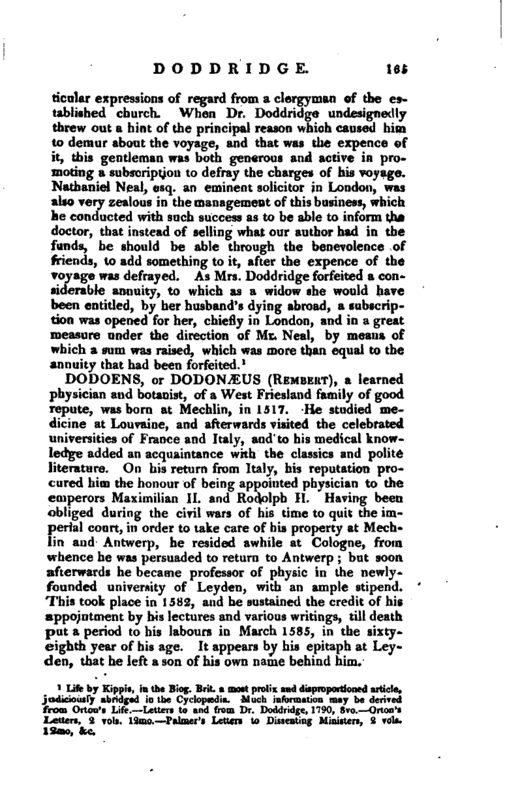 He studied medicine at Louvaine, and afterwards visited the celebrated universities of France and Italy, and to his medical knowledge added an acquaintance with the classics and polite literature. On his return from Italy, his reputation procured him the honour of being appointed physician to the emperors Maximilian II. and Rodolph II. Having been obliged during the civil wars of his time to quit the imperial court, in order to take care of his property at Mechlin and Antwerp, he resided awhile at Cologne, from whence he was persuaded to return to Antwerp but soon afterwards he became professor of physic in the newlyfounded university of Leyden, with an ample stipend. This took place in 1582, and he sustained the credit of his appointment by his lectures and various writings, till death put a period to his labours in March 1585, in the sixtyeighth year of his age. It appears by his epitaph at Leyden, that he left a son of his own name behind him. | Dodoens is recorded to have excelled in a knowledge of the history of his own country, and especially in genealogical inquiries, as well as in medicine. His chief fame at present rests on his botanical publications, particularly his “Pemptades,” or 30 books of the history of plants, in 1 vol. folio, published at Antwerp in 1583, and again in 1612 and 1616. 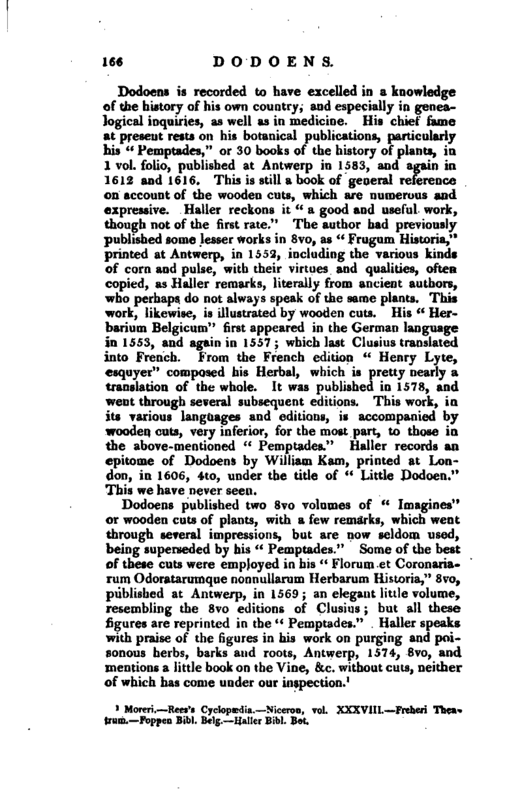 This is still a book of general reference on account of the wooden cuts, which are numerous and expressive. Hailer reckons it “a good and useful work, though not of the first rate.” The author had previously published some lesser works in 8vo, as “Frugum Histona,” printed at Antwerp, in 1552, including the various kinds of corn and pulse, with their virtues and qualities, often copied, as Haller remarks, literally from ancient authors, who perhaps do not always speak of the same plants. This work, likewise, is illustrated by wooden cuts. His “Herbarium Belgicum” first appeared in the German language in 1553, and again in 1557; which last Ci us ius translated into French. 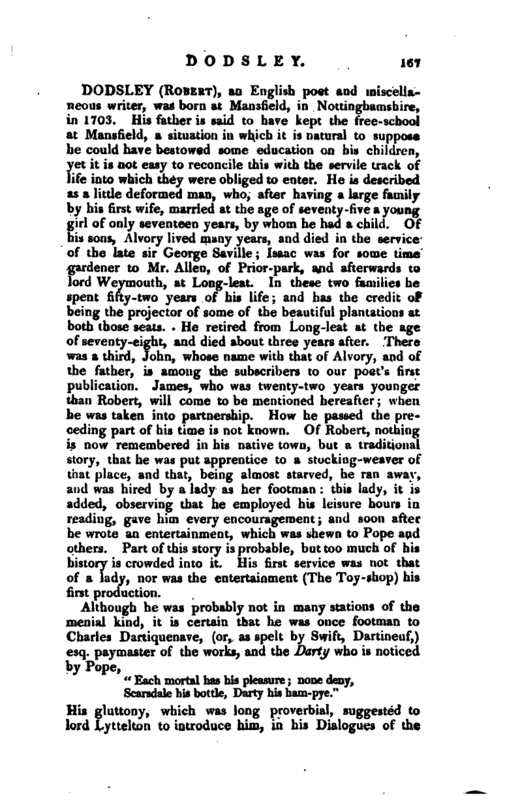 From the French edition “Henry Lyte, esquyer” composed his Herbrl, which is pretty nearly a translation of the whole. It was published in 1578, and went through several subsequent editions. This work, in its various languages and editions, is accompanied by wooden cuts, very inferior, for the most part, to those in the above-mentioned “Pemptades.” Halier records an epitome of Dodoens by William Kam, printed at London, in 1606, 4to, under the title of “Little Dodoen.” This we have never seen. Moreri.—Rees’s Cyclopædia.—Niceron, vol. XXXVIII.—Freheri Theatrum.—Foppen Bibl. Belg.—Haller Bibl. Bot.